Watching the F1, and impressed that others are watching it too. I went down today to a sports bar near Piccadilly Circus called the Sports Cafe, which is an eerily similar name to my favourite bar in Toronto, the Sports Centre Cafe, which I wrote about before leaving Canada. I was heading down to watch the Formula One Canadian Grand Prix from Montreal. I know what you are thinking, why would I travel all the way to London just to watch Canada on TV. But the cars go vroom-vroom and go real fast! It's cool. The bar was mostly filled with Croatians and Austrians for the Euro 2008 match between the two countries, but there was a small group of fans who huddled around the few TVs showing the F1 race. It was impressive to see people not just watching the race, but applauding a well-timed and executed pit-stop during a full course yellow. These people knew their stuff, and made me (who was often one of the few people in Toronto who could speak at all about F1 racing) feel like a bit of an idiot for not knowing more. What was interesting, I found, was that when UK-born Lewis Hamilton, then points leader of the F1 season crashed, there weren't groans of disappointment. Instead, there were cheers. It seems that Lewis Hamilton is not very popular with the folks that were at the Sports Cafe this Sunday. Damon Coulthard, a fellow Brit, was applauded when he finished third, however. Not sure why the animosity towards Hamilton, it is something I will have to explore in the future. As the race wound down the next Euro 2008 game started up. The game featured Poland versus Germany, which was interesting to note because Poland's Robert Kubica finished first, ahead of Germany's Nick Heidfeld. 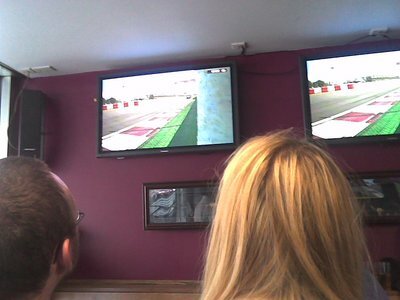 The Polish fans in the bar were cheering both for Kubica's win and the start of the Euro game. Soccer (footie) I can understand - two teams kick a ball until one puts it in a big net. Racing I can understand - people drive cars really fast until one guy crosses the line ahead of the other guy. But some English sports escape me. The following conversation took place during the interlude between the Austria-Croatia game and the Poland-Germany game. Man, looking up at TV screen. "Oh my, van Barneveld beat Taylor!" Woman, sounding shocked. "No, but Taylor had that 9 darter yesterday." Man, shaking his head. "Look at that! It was 9-9! Can you believe Taylor lost?" Woman, looking forlorn into her beer. "Unbelievable." They were talking about darts. Seriously. And while I don't understand the appeal of watching professional darts, at least I understand that concept of darts (throw sharp things at target). Don't get me started on cricket, where the TV announcer will stay stuff like, "Left-arm quick Sidebottom, who finished with figures of six for 77, routed the New Zealand lower order on his Nottinghamshire home ground, but it was fellow fast bowler and man-of-the-match James Anderson, with a Test best seven for 43 in the first innings. Meanwhile, Mike Hussey had 74 no out, with a top score of 244." I think I'll stick to the soccer and the racing for now. After the sports bar, I took the tube home from Piccadilly Circus. Some of the tube stations in London are really far below ground, and you have these really long escalators down to the platforms. I arrived at one of the escalators to find that no one else was on it. I had a completely clear moving stairwell just for myself. I started down, and soon found myself running faster and faster down the stairs. I could feel the wind coming up against me. I started laughing and put out my arms, just like when we were kids pretending to be airplanes. I could almost feel myself taking off. Things have been pretty hectic that past week, trying to get my new life in order, and that is likely to continue for the foreseeable future. This Sunday, though, was a free day - nothing to get done accept watch some sports and act like a little kid on the tube line. To feel the wind on my face, to feel myself starting to lift off the ground thanks to the wind underneath my arms. It was a reminder that once all this work of settling in settles down, I'll have a whole new world to explore. The very thought lifts me up. It's interesting how the more things change...the more they stay the same. Although I agree with you about cricket. I can't seem to wrap my mind around it. Good luck this week!